With baseball in it's final series of 2009 I wanted to share some of my thoughts on baseball, branding and social media, thoughts that have been brewing for a while. I currently live in Washington, D.C., a plane ride away from my favorite baseball team, the Chicago Cubs, and within driving distance of the two teams with the worst records in baseball this past season, the Baltimore Orioles and the Washington Nationals respectively. They both lost a lot of games this year (98 and 103) which only makes me miss my hometown Cubbies even more but let's not forget they have been nothing less than disappointing for over a century. Even in 2003, where I was five outs away from doing Wrigley Field victory dance by heading to the World Series they found a way to break my heart. But every season, I still come back with even more resilience that it could be the Cubs year. That said, due to my social technology and media background (my baseball skills probably didn't hurt either), I was invited to meet with the Washington Nationals executives last month at Nationals Park. I was honored to do so and in meeting with Stan Kasten, Bob Wolfe and others I realized that they are just a three year old start-up that spun out of what was the Montreal Expos organization. Call me an optimist but I think they have an almost clean slate, branding-wise, that offers them a huge opportunity to create a strong following both online and off. I got a chance to visit Intel this week as I was selected to the "Intel Insider" advisory board as the leading microprocessor chip maker anchored in Silicon Valley looks to make some changes in the way they reach out to their customers. What does this mean? 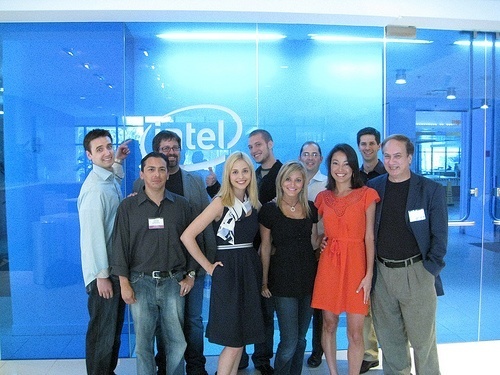 It means that Intel has embraced social media and has pulled in a dozen bloggers, video bloggers and social media/community experts to pick there brains on Intel's brand strategy. It means I will have the scoop on products and new developments at Intel. As an Intel Insider I will be a part of the conversations related to leveraging social media at Intel and lend some brand association for my own personal brand to Intel. Why would I become an Intel Insider? First, I think it is a great experience and should be a lot of fun. Second, I want to be in the know on the latest Intel advancements and technology so I can offer it up to SOMEWHAT FRANK readers. Additionally, Intel will be supplying me with a MacBook Air which they worked with Apple to ensure an Intel chip would fit inside the slim notebook. 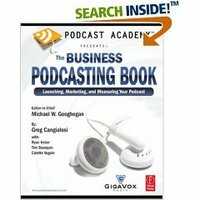 I got a chance to chat with Greg "The Trend Junkie" Cangialosi, CEO and President of Blue Sky Factory, today regarding his new book "The Business Podcasting Book ." 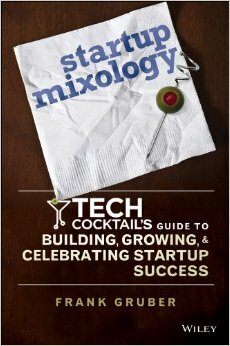 The book is a great guide for any corporate executive or other party interested in better understanding podcasting. Greg and I chatted about a number of topics related to podcasting and social media which ranged from discussing our podcasting pal Gary Vaynerchuk who has been changing the wine world to a quick getting "how to get started with podcasting" step-by-step. How can you engage your client community via blogs and social media? 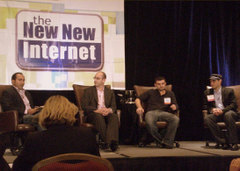 Last Thursday, I spoke on a panel at The New New Internet Conference to discuss this very question. The panel consisted of Gary Vaynerchuk video blogger at Wine Library TV and Director of Operations at Wine Library, Geoff Livingston blogger at The BuzzBin and author of Now Is Gone and Rohit Bhargava blogger at Influential Marketing and author Personality Not Included and myself blogger at Somewhat Frank, co-founder of TECH cocktail a community-building event startup and product manager of myAOL. If you want to find out about social media you best watch the video and learn about blogging, engaging social media and hustle 2.0! Have you ever given a stick figure life with a flipbook? Erbert & Gerbert's has put its own spin on a flipbook by creating what they are calling the first ever human flipbook. It is posted at humanflipbook.com. It's a very artistic and clever way to passively promote the Midwest-based sub and club sandwich shop.